Injury claims can be complicated issues if you don’t have the right expertise on your side. At First Personal Injury, we can explain everything so you understand how the personal injury claims process works. Contact our team to find out about making a claim today. Below we have answered the most commonly asked questions about personal injury and accident claims. If there is anything that you feel is not answered fully here, please do feel free to contact our team of injury lawyers on the telephone number above and we will endeavour to answer your queries fully. Yes, if you’ve had an accident in the last three years that wasn’t your fault. You might have had a road traffic accident where you were the driver, a passenger, a pedestrian, a cyclist or a motorcyclist. Or you may have had a slip, trip or fall when you were out and about. Or you might have had an accident at work. In all these situations, you can make an accident claim. The three-year timescale runs once an individual has reached the age of 18 years old. Someone under 18 years old who has an accident has until they are 21 to make a claim no matter when the accident happened. Call us on 0800 808 9740 or complete our online enquiry form to request a callback and one of our team will be in touch without delay. They’ll talk with you about your accident and, if you have a case for compensation, will take care of everything for you. They’ll explain everything as they do it and also give you the very best chance of winning your claim. Our lawyers do. 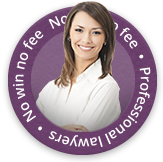 They are highly experienced personal injury lawyers who specialise in accident claims. Whether you have a small claim for a minor accident or a very significant claim for a life-changing injury, our expert team will deal with you on a one-to-one basis and give you the very best legal care available. All you need to do is tell us the details of your accident. You can leave the paperwork to our lawyers. They will arrange for any medical reports that might be required and will ask you if they need anything else. It works like this: our injury lawyers write to the insurer of the faulty party and their insurer decides whether to accept responsibility for your accident or not. Is the law different in Scotland? Yes. There are a few important differences. Firstly, some of the terms used are different. Please get in touch & we can help you with your Accident Claim in Scotland. Our personal injury lawyers handle all aspects of your accident claim so you don’t have to. Our team will take care of the paperwork and keep you updated on your claim’s progress along the way. They’ll also tell you if you need to attend a medical appointment with a local independent doctor. If you do, they’ll include your travel expenses in your claim. It depends on the circumstances of your accident claim. A simple claim can be settled in just a few months. A claim involving a more serious injury will take longer. Our team will advise you on how long you can expect your claim to take. If you’ve suffered a very serious injury it will be in your best interests that our specialist personal injury lawyers take enough time to assess the extent of your medical problems and the care you may need in the future. Whatever your situation, our panel of lawyers will put your interests – now and in the long term – first. If you feel that you have cause to make a claim for compensation then why not contact our team of personal injury lawyers. In a confidential initial consultation, we’ll be able to learn more about your circumstances and advise whether we can help you get started with a claim whatever type of injury or accident you have been involved in.